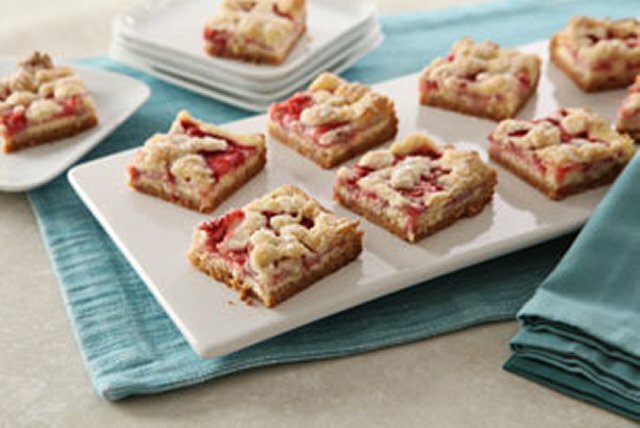 You won't be able to resist these delicious bars made with fresh strawberries, cream cheese filling and a crumble topping. Beat butter, 1 egg and cake mix in large bowl with mixer until crumbly. Reserve 1 cup crumb mixture; press remaining onto bottom of 13x9-inch pan sprayed with cooking spray. Bake 10 min. Meanwhile, beat cream cheese, granulated sugar and vanilla until blended. Add remaining egg; mix well. Spread cream cheese mixture over crust; top with strawberries. Sprinkle with reserved crumb mixture. Bake 45 min. or until centre is set and crumb topping is lightly browned. Cool completely. Refrigerate 30 min. before cutting into bars. Garnish with sifted icing sugar just before serving. Substitute raspberries or blueberries, or a combination of both, for the strawberries. Line empty pan with parchment or foil, with ends of parchment extending over sides. Use to prepare dessert as directed. When ready to serve, use parchment handles to lift cooled dessert from pan.